Microsoft's Applied Sciences Group has released a video which shows the company has been focusing efforts on reducing touch screen input lag. According to Microsoft, most touch-sensitive devices have a response lag between 50 and 100ms. However, their new screen technology reduces that lag to an almost imperceptible 1ms. For larger touch screens -- like Microsoft's Surface -- input lag can be hugely noticeable. The input delay becomes especially perceptible when drawing or quickly moving objects around with your fingers. This prompted engineers at Microsoft to look into ways of improving this deficiency. Although the company doesn't detail the technology's inner workings, the video demonstration they provide gives a good sense of how their research may greatly improve the touch-based user experience. Paul Dietz, assistant director at Microsoft Applied Sciences, compares 100ms, 50ms, 10ms and 1ms devices by dragging an object around with a single finger. The improvement between 100ms and 10ms is immediately evident while even the 10ms and 1ms demonstrations are fairly substantial. One can definitely get a sense of how "right" the 1ms touch screen feels when compared to its slower counterparts. 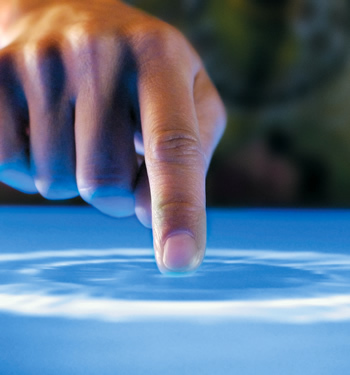 Microsoft isn't the only company dabbling with ultra low-latency touch screens, though. Synaptics showed off their own take on a low-latency touch screen device at the Mobile World Congress both last year and this year. Also, although many would argue styluses are dead, it is hard to deny their usefulness for drawing and writing. Given the very poor input response that most stylus devices seem to suffer, such advances may prove especially useful for stylus users.